Among the wills recently added to Essex Ancestors are a number of wills from the Dutch population of Essex, almost all of which are from testators in Colchester. From the 1560s onwards Flemish and Dutch Protestants, fearing religious persecution, came to England. Flemish weavers had first settled in Colchester in the 14th century, and many of the new refugees chose to settle in the town. They brought with them the techniques of bay and say weaving which revitalised the town’s cloth industry and brought prosperity to Colchester for the next 150 years. The Dutch wills can be found on Essex Ancestors by using the search term ‘Dutch will’. They are either written in Flemish or record testators with Flemish names. These wills often have a distinctive style, clearly differentiating them from others of the same date. 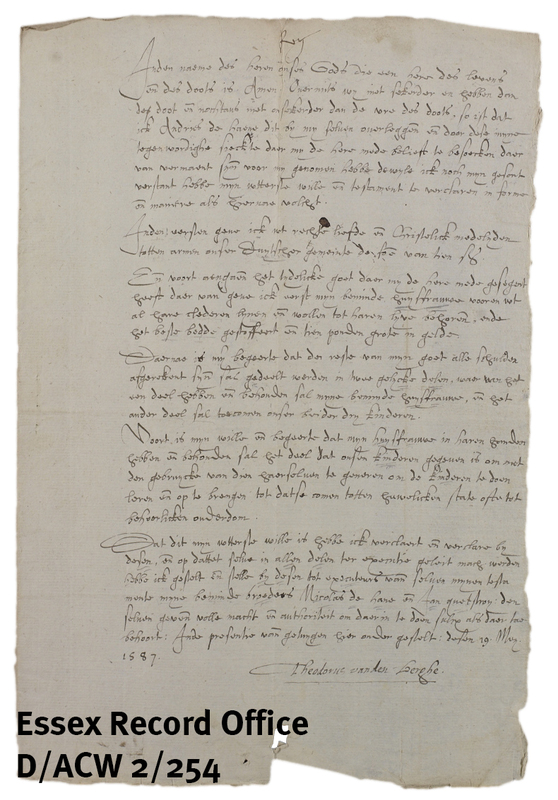 The will of Andries de Haene dated 19 May 1587 (D/ACW 2/254) is typical of these wills. It was proved in the archdeaconry of Colchester, and although no parish is recorded for the testator, it is very likely that he was resident in Colchester. There are two versions of the will, one in English and one in Flemish. ‘for because that wee have nothinge more surer then death and that the houre of death is most uncertein’. Similar phrases to this often appear in the Dutch wills in contrast to English wills of the same date. The first bequest is of 10s. ‘for Love and brotherlye charitys sake to the poore of oure duytch congregation’. Charitable bequests were quite common at this date and the Dutch wills usually include bequests to the Dutch congregation in Colchester. The next bequest is to his wife who was unnamed but described as his ‘lovinge bedfellowe’. He left her ‘all her clothes Lynen and Wollen apartayninge to her body and also the best bedde wyth all thinges longing to the same’, together with £10. Bequests to wives of their clothes and a bed appear to be a Flemish custom, in the will of Nicolas de Hane of 1584 (D/ABW 12/181) he specified that if his widow were to remarry she would retain the bed and appurtenances ‘According to the custome of the towne of Helle’ [Halle, Belgium]. Andries de Haene continued by dividing the remainder of his goods into two parts, one part for his wife and the other for his children. In most such cases the wife was given custody of any children and to keep their inheritance safe for them until they married when they would inherit. Theodorus van den Berghe (the second minister of the Dutch church in Colchester) in his will of 1598 (D/ACW 3/166) specified that children should be given their inheritance on their wedding day ‘or when they come to yeares off great discretion’. 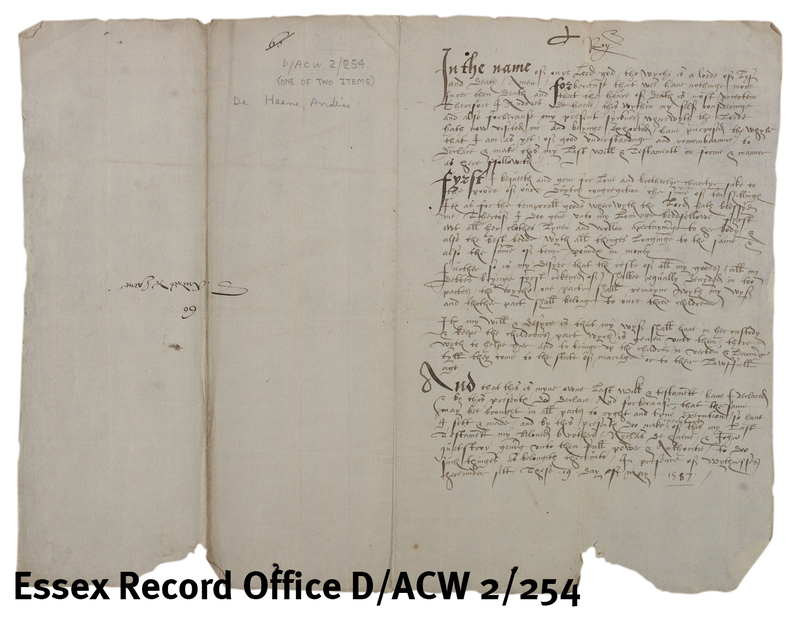 William Casier, son of Malius, who was born in Meenen in Flanders [Menen, Belgium] specifically stated in his will of 1588 (D/ABW 9/259) that this was the ‘use of … Meenen’. He also required that if his wife had to leave the country while still a widow, then any unmarried children should ‘helpe to beare the chardges of the voyage’. It would seem that his widow Katherine did not have to leave and did not remarry as her will of 1590, when she was resident in the parish of Holy Trinity, Colchester also survives (D/ABW 9/287). She left all her possessions to their four children Walter, Maliard, Josentge and Annanais (the executor). Over the course of the 150 years, many of the Dutch names became anglicised many married into English families. Almost a century after the Dutch arrived Abigail Hedgethorne, a widow of St. Martin’s parish in Colchester (in the heart of the present-day Dutch Quarter of the town) left a will in 1666 (D/ACW 17/185). As well as the English copy there is a version in Dutch where the family name was given as Hagedorn.